Each year podcasters from around the world focus on something pretty meta: celebrating the power of podcasts. The inaugural event in 2014 trended on Twitter for almost the entire day. And it’s only gotten bigger and better each year. This year, we reached out to International Podcast Day champions, Steve Lee and Dave Lee, to get their perspective on this popular podcasting event. Why do you do this year after year? There is always a region or country that is growing in terms of podcasts being produced and the consumption of podcasts. That is an opportunity to highlight those regions and provide a voice to those podcasters and listeners. Just as the podcasting industry evolves year after year, so does the event and celebration. And after 4 years of organizing the celebration, it’s evident that the podcast community is embracing the celebration. They plan meetups and social gatherings just for the day. People (podcasters, listeners, producers, networks, etc.) look forward to the celebration and that keeps us motivated and excited. What is the coolest thing that has happened since it started? One of the coolest things that has happened is that we encourage our speakers to present in their native language or language of choice. So we’ve had sessions in German, Spanish, and Italian. This brings a new element to the celebration. The presentation is different; the audience is different; the chat room is transformed. Another cool thing that has happened is the integration of the Podcast Awards ceremony during the live stream. What is something unexpected that’s occurred? When we started this in 2014, we never expected the celebration and event to make national or international headlines or make the news broadcasts. Yahoo News, CNBC, ESPN, New York Times, T-Mobile, and several local news outlets have written or broadcasted about the event. What started as a 6-hour event in the United States has turned into a 30+ hour event with international representation. A major unexpected outcome that happened was that #InternationalPodcastDay has trended Number 1 & 2 on Twitter for numbers of hours during the last three celebrations. We never expected that to occur. How have you changed it up a bit this year? Every year we try to add countries that have not been represented. Last year we invited podcasters from five African countries. This year we have invited podcasters from India, Philippines, and the United Arab Emirates. The interesting dynamic of inviting Hebah Fisher (UAE-based) is that Google Hangouts on Air (the platform we use to broadcast live) is actually blocked in the UAE. We had no idea. So we are working with her to record her presentation and broadcast it as a recorded video. She will be joining the live chat to respond to questions and comments. This is something new that we never imagined happening. Rather than passing on having the UAE represented, we worked around a solution so the international community could hear the UAE’s voice. Grab your mic and camera, ask someone about their favorite podcast. Share the response on social media! Not a podcaster? Become one! It’s easier than you think, especially if you choose Blubrry as your platform. We offer world-class Podcast Hosting, Podcast Stats, extensive customization options, distribution to all the major discovery platforms, and complimentary phone support with real, live humans in our Support center. We are constantly improving our podcasting solutions. This year, to celebrate International Podcast Day, we’re rolling out a couple cool features to help you personalize your podcast even more. Yep. Emojis are coming to Blubrry! They’ve been searchable by Google for a couple years. And now those ubiquitous little images we’ve all begun to use–sometimes even in professional correspondence–will shortly be able to be used in your Show Notes if you are a Blubrry customer. We’ll be rolling it out by 9/30/18. Have a specific portion of your podcast you want to make sure everyone notices? 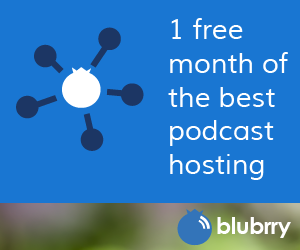 Now, if you’re a Blubrry customer, you’ll be able to link to a specific time stamp in your podcast. Great for use in show notes or social posts. We’ll be rolling this one out to Blubrry users by 9/30/18. How are you celebrating International Podcast Day this year? Sound off in the comments or hit us up on Facebook or Twitter.